What’s the origin of the name Pomodoro? The father of this technique is an Italian – Francesco Cirillo – who developed it in the late 80’s. 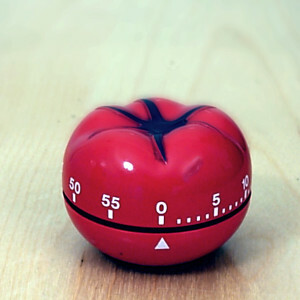 The name comes from the tomato-shaped timer which Cirillo used as a student. Just a list of tasks, something to write and of course our hero-kitchen timer. An ordinary cell phone timer will do, it just has to give you a signal that 25 minutes have elapsed. This technique is based on 25 minute cycles called pomodori, which are devoted to working on a particular task. All the time you should be able to see how much time is left till the end of a pomodoro. Those 25 minutes are followed by a 3-5 minute interval. This is a key element of the technique. Use these 5 minutes to relax – make coffee or tea, take a short walk or do some exercises. Don’t keep sitting at your desk. It’s your time for a short relaxation. Listen to your favorite songs or look through the window. If you do not have a specific task list you should define the following tasks in this spare time. After 4 cycles take a 15-30 minute break for a longer relaxation. The basic principle is that pomodori are indivisible. Throughout every 25 minutes you focus only on one task only. You don’t get distracted by less important things and you don’t let others disturb you. You should divide larger tasks that can occupy your 5-7 cycles into smaller ones. If you have a task that will take less than 25 minutes, combine it with another one so that the whole time is filled. Select one task from your task list. Ideally the list should be a sequence of tasks sorted according to their priority. Set the timer for 25 minutes – its the time that you spend on performing one task or its parts. Tick off completed task – after 25 minutes you can enjoy the completed task or its part. 5 minutes break – after every 25 minute cycle make a 5 minute break. Divide your time into short sections which allow you to focus on one particular thing. If you know in advance how much time you can spend on a specific task, you can effectively focus on this very task. Thanks to regular pauses you know that soon it will be time to relax and you will be able to take some rest. The effectiveness of this method is affected by external factors, which may distract your attention from the task (co-workers talking, facebook, phone, etc.). Therefore this method is ideal for people working in silence, e.g. at home and maintaining self-discipline.